Alice is a brindle & white, small and very harmonic young lady. front shows a well developed chest. She moves freely. breeds puppies. For now she has won lot of Best of Breed in puppy class and placements in puppy Best in Shows. Alice showed her quality in juniors, in her first time juniors she won Best of breed and become East-Central Europe Winner. Next two shows brought two Estonia Jun-CaC and Jun-BIS 4 place. The big winning was in Poland, Alice gain Best in Show Bulltype terrier and she won 3 place in Terrier Group, last but not least she won Best in Show Junior over 55 juniors. 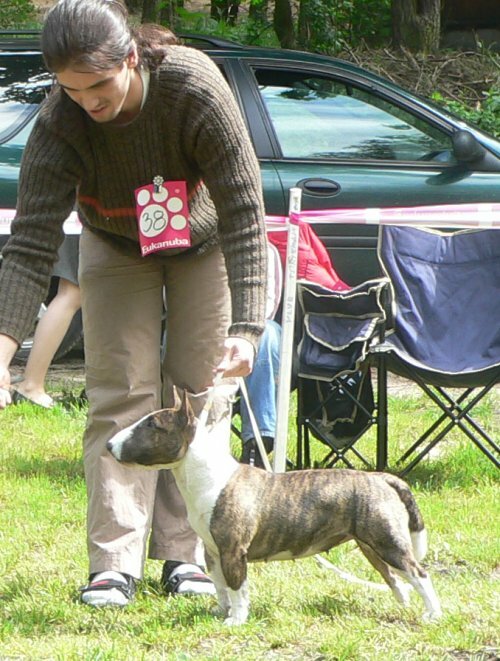 Two years road Alice has won Baltic Winner Show Best of Breed Miniature Bullterrier. Alice continues in champion class. From year 2006 Alice is owned & loved by Aga and Kris from KIA kennel Poland. Alice is a mother of our "L" litter.